Cover-As covers for the opening salvo’s of crossovers go this one is pretty decent. We have the titular black vortex is front and center with all the involved parties in the background. Art– Ed Mcguinness and Kris Anka have two different styles and they clash. As a result this is not a very consistent book and will not be winning any rewards for art. Story– Twelve Billion years ago on the planet Viscardi the people try to advance to space travel but hit a road block while one of the celestials watches over them. Years ago the planet is a derelict, the last Viscardi witnesses as the celestial leave there planet behind. One of them lashes out verbally at the creature and is given the Black Vortex as a reward. On Earth Magik grabs beast and Storm along with the time lost original X-men and takes them into space. Elsewhere Peter Quill’s father uses the Black Vortex to transform one of the Blood Brothers to join the ranks of the Slaughter lords, other aliens who have also been changed by the Vortex. By doing this he is given the fealty of Thane, the son of Thanos last seen during Infinity. The Vortex is stolen by Shadowcat and Star Lord. 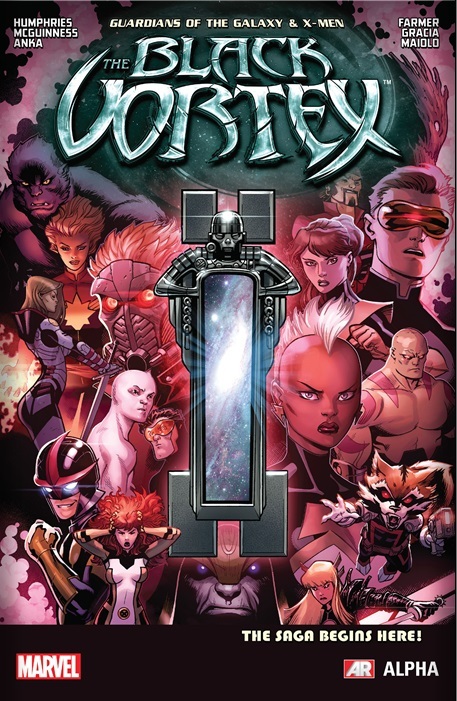 They take it to Spartax where both the All New X-men and the Guardians muse over using it or not. When they are attacked by the slaughter lords Gamora uses the vortex and is transformed. Black Hero– Storm shows up and we see what a powerful cosmic level being she could become by embracing the powers of the Vortex. Will it happen? Maybe! Will it last? Perhaps not! Meh- yet another event, this one fails to either excite me or make me want to run out and throw money at the problem. I was most/ only interested in Storm and how she was depicted. Regarding in the part in which Ororo see herself as a cosmic level being . I note that she was ( apparently) first moving to stop a small child( or a child like individual ) from getting too close to a potential danger when she got a look at what she could become . That act of protection sparked a sour observation that again we see the maternal nurturing “Mammy ” character who is not allowed to have a husband or a family or a life of her own , instead always serving and saving others.